How, according to the editors, is Kipling a "poet of British imperialism" (986)? Explain the meaning and significance of the epigraph. Explain Carnehan and Dravot's "Contrack." Explain Dravot's interaction with Imbra (the stone idol) and the blond men. Explain the use of Freemason rituals in the solidification of Carnehan and Dravot's control in Kafiristan. Why do they rename all the men? Explain the difference in Dravot's mind between the "sons of Alexander" and the "common black Mohammedans." (see also 1005). Explain the significance of the final exchange between the narrator and the Superintendent. 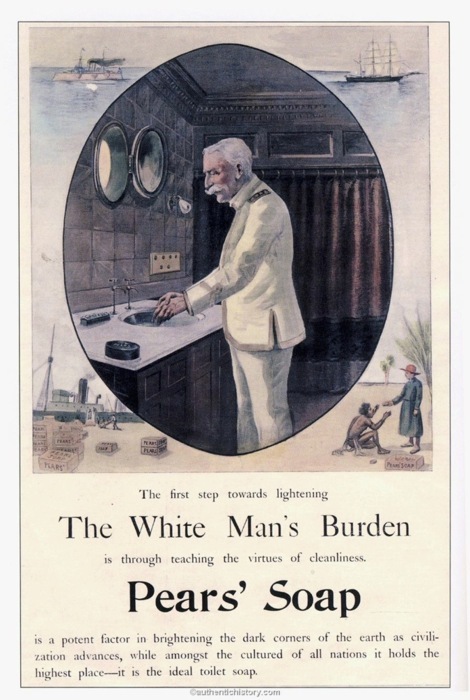 What exactly is the white man's burden? Describe the speaker's attitude toward colonized people of color. Why is the narrator taking a train at the beginning of his story? Where is he going and why? What are the Native States? (See also 988, fn 9.) Why do they "have a wholesome horror of English newspapers" (989)? Explain the narrator's message to the man with the red beard. Does the narrator enjoy his job as editor of a newspaper? Explain. Why have the two loafers (Peachey Carnehan and Daniel Dravot) sought the narrator out? Describe the "priest"? and his assistant. What are they doing with mud dolls and whirligigs? Describe Peachey's appearance when he returns two years later. Explain Dravot's and Carnehan's differing opinions on the prospect of securing wives. Why does Dravot's prospective wife bite him? Explain: "Neither God nor Devil, but a man!" (1008). Why does Peachey get crucified? Explain: "Go bind your sons to exile / To serve your captives' need" (3-4). Explain the final four lines.